We have family in from out of town and have been busy, busy, busy! Having fun. Today, I would like to feature a few newbies from last weeks party. Painting furniture using spray paint and stencils, A pretty burlap wreath, a clothes pin mirror, and a Kitchen facelift! Kathryn from the Ugly ducklingtransformations did a fantastic job! What a pretty gallery wall! 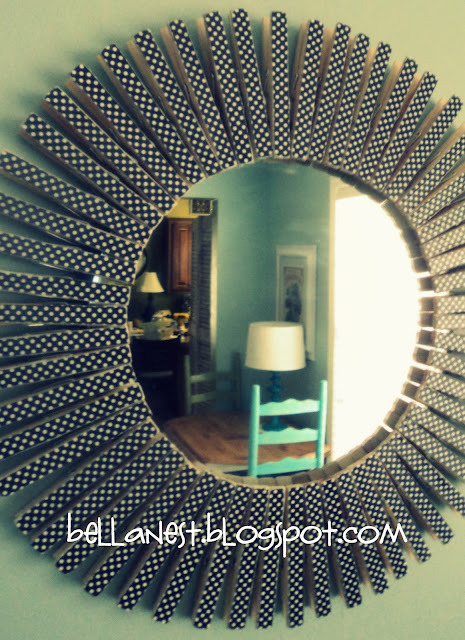 Next, Bella Nest with the cutest clothes pin mirror..
Last feature of the day.. I love the bench and the pretty chande! Looking forward to a new week! I am feeling much more comfortable over here at Word press now. As you can see tweaking here and there. Many ways to follow me on my side bar. the old one must be removed in order for the new one to come up. FEEL free to grab my crowed about you button if you were featured today! is having a new series on her BLOG to help newbies as well. You may want to check it out, and learn a few things along the way. Cute features and enjoy your guests. Doug’s back is bad again so I am nursing him. Maybe this time he will get a MRI. I really love the bench and table in the corner of the room. It looks so cozy and somewhere I would love to stop and chat with friends and a cup of coffee!! This reply part is cool over here to add more stuff/comments. Thanks for the add back onto you roll. I saw I was gone, but I know I was not forgotten…he-he… I can only imagine how hard that switch was. Great job hanging in there. It looks wonderful over here in wordpress land. Never forget you Miss Kate! I just could not keep track of all the blogs I follow to add you back at one time. Like I said my best method now is as comments are coming in, I am adding. It’s a process for sure. What A great feature as always. Thanks for sharing. enjoy your weekend. Thanks for the feature Debbie! A great start to my day today… just found out that I’m an Aunt to a little girl!! Hello Debbie dear! Those are wonderful projects, I love the burlap wreath! I tried to change your url but when I click on “manage” in my dashboard I get an error page…waaaaaaa!!! Anywho, I signed up through email and will just follow you through that until Blogger fixes their issue…which I’m highly doubting will happen. Great features, so glad you are feeling more comfortable, enjoy your day! Great features, Debbie. That dresser is beautiful! Glad you are feeling more at home in your new arena. We all love you being happy & sharing all your wonderfully awesome & creative things! Great features! When I saw your post title my first thought was that you had a very busy weekend! Thank you so much for the feature Debbie! Love all the others as well. Hi, Debbie, thank you so very much for the feature. I’m quickly approaching my 6 months and 200 followers and it’s going to be very sad when I can’t link up with Debbiedoo’s any more! =( I’ve learned so much from you and your blog and it’s been a lot of fun meeting other new bloggers at your parties. Thank you for hosting all us newbies each week!!! I’ll miss you! The clothes pin mirror is really neat and clever. That clothespin mirror is so cute!